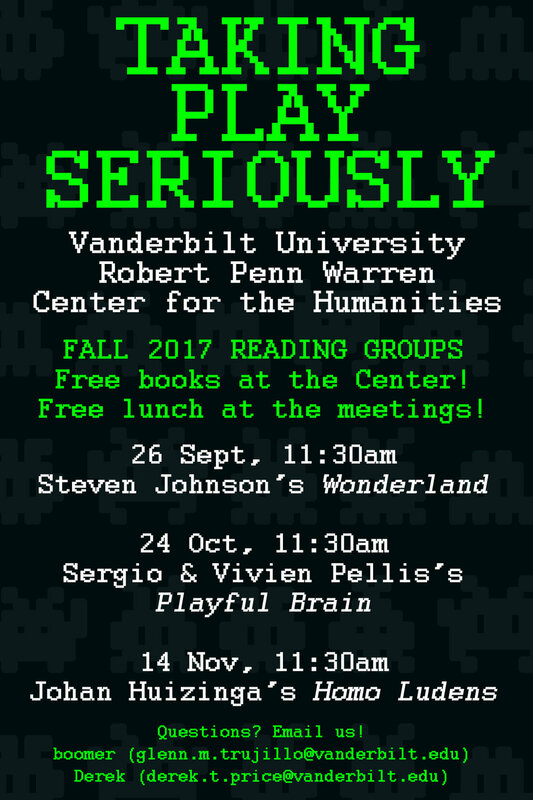 All events are hosted at Vanderbilt University's Robert Penn Warren Center for the Humanities, who has generously provided the venue and funding for books and food at each of the events. This group will focus on two questions: what are games and play, and what makes some forms of games and play good, ethically or politically? The group will host two types of events. First, reading groups will discuss four books that draw on media studies, history, psychology, and neuroscience. Second, public talks will focus on specialized themes, twice as digital colloquia (lectures and discussions with experts in the field) and once as a panel on exclusion in gaming communities. Meetings are set for September 26, October 24, and November 14, all at 11:30 a.m. at the Warren Center. Seminar coordinators: Derek Price (German, Russian, and East European studies, comparative media analysis and practice) derek.t.price@vanderbilt.edu and Boomer Trujillo (philosophy) glenn.m.trujillo@vanderbilt.edu. Bernard Suits' "Is Life a Game We Are Playing?" Panel Discussion, "Exclusion in Gaming"
Stephanie Boluk (UC Davis Department of English, and Cinema and Digital Media Program) & Patrick Lemieux (UC Davis Cinema and Digital Media Program), "From Metagames to Moneygames"